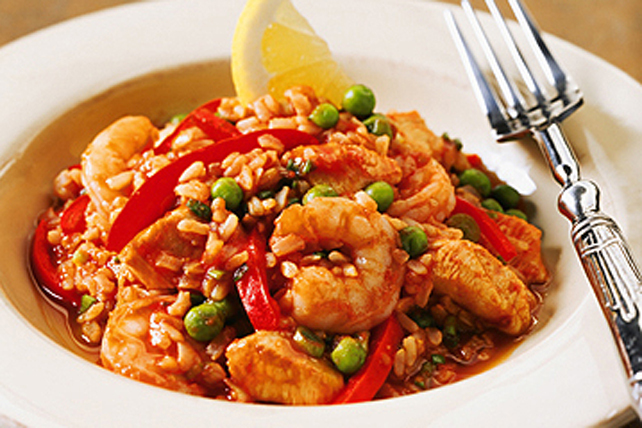 Chili sauce adds the perfect spark of flavour to this delicious rice pilaf. Heat oil in large saucepan on medium heat. Add chicken; cook 4 to 6 min. or until lightly browned, stirring frequently. Add peppers; cook 3 to 5 min. or until crisp-tender, stirring frequently. Add rice, chili sauce, garlic and saffron; mix well. Gradually stir in broth. Bring to boil; cover. Simmer on medium-low heat 15 min. Stir in shrimp, peas and onions; cook on medium heat 4 min. or until shrimp turn pink, stirring frequently. Add chopped cooked chorizo to hot oil in saucepan along with the cut-up chicken.